Orange flavor drink mix adds color and flavor to angel food cake mix batter. Serve with whipped topping and fresh fruit for an elegant dessert. Prepare cake batter and bake as directed on package for 10-inch tube pan, adding drink mix to cake mix in bowl before adding the water. Cool completely. 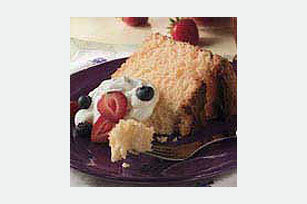 Serve cake slices topped with COOL WHIP and fruit. Substitute 1/4 cup KOOL-AID Orange, Cherry, Grape or Lemonade Flavor Sugar-Sweetened Drink Mix for the TANG.